“Impyrium" takes place three thousands years in the future and is a city ruled by the Faeregine dynasty and magic. But their magic is fading out and many people are beginning to believe that it’s time for the rule of the Faeregine family to come to and end. We follow the youngest member of the royal family, Hazel, and Hob a commoner and spy—friends, but with two different missions. One to protect the dynasty and the other to destroy it. I loved the magic system and the world building very much. The writing was very strong and the world is super interesting. We do get to know Hazel and Hob well enough, but I do wish I could have felt like I was closer to them or cared more for them. There is just SO MUCH to build up in this story and so much happens and is going on. I think now that we’ve got the world and magic and plot established we’ll come to know Hazel and Hob much more in the following books. I am 100% continuing with this series. I enjoy Neff’s writing and am super interested in where this series goes! Such a fun read and one that I will readily recommend to people. I love the feeling of entering a new (to me) world and learning about it. 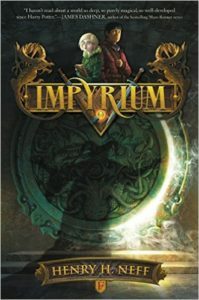 If you’ve read Henry Neff’s Tapestry series, he has said that Impyrium does take place in that world, although 3,000 years after the Tapestry series concluded. So some of it will be familiar, but many things have changed.